This is a popular new presentation of the conception of civilizations in The Fire and the Stones. It updates and reorganises Part Two of that work. While covering the genesis, progress and decline of 25 civilizations it highlights the European and North American civilizations which together make up Western civilization, and answers the question, “Is Western civilization in terminal decline?” The events of Western civilization have been updated to 2007. A chart gives a date-based summary of the 61 stages in the life cycle of 25 civilizations, and includes projections for living civilizations. 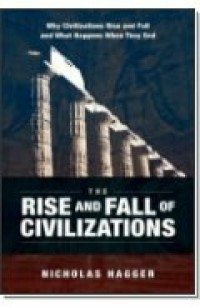 The Rise and Fall of Civilizations is a sequel to The Light of Civilization, the most monumental study of the history of civilizations for several generations. Here, Hagger outlines the patterns of the civilizations themselves, providing a unique interpretation of the dynamics of their origin, rise and collapse, and how one civilization leads into the next. Essential reading for students of history, it will interest all seeking to understand historical patterns and where our civilization is headed today. Nicholas Hagger’s books reveal truths that have been hidden, and are rewarding. He has devoted much thought to unearthing the pattern of history, and he presents a new approach to the history of 25 civilizations.